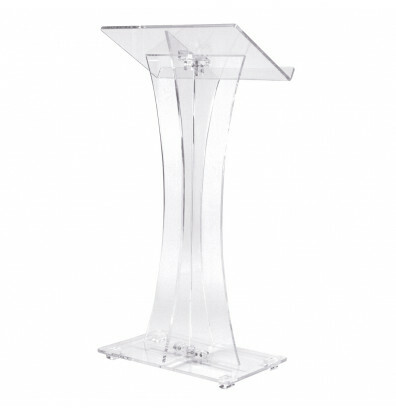 Oklahoma Sound clear acrylic shelf lectern offers a contemporary style curved plexiglass design. Oklahoma Sound clear acrylic shelf lectern offers a curved plexiglass design ideal for use in worship or contemporary business settings. Wide reading surface features a book stop to secure reading materials or other presentation equipment. Includes one shelf conveniently placed for added storage. Ships ready to assemble.